Places to see at Bhalki Machan: The main attraction of Bhalki Machan is a huge man made lake amidst dense vegetation. While visiting the place you will feel excited to learn that the very site was the game reserve of the erstwhile Zamindars. They used to build watchtowers (machan) at one side of the water body and hunted wild animals using bows, arrows and guns. This has given the place its name Bhalki Machan. While walking through the forest path, you will also find the remains of an age old watchtower, which is believed to be build by the ancient Zamindars. It is also said that there was a far-reaching tunnel built beneath this watchtower. It may be true for you can locate a partly filled hole at the site, though nothing can be concluded firmly. However, it can be said that these enchanting stories will surely enrich your holiday experience in Bhalki Machan. Things to do at Bhalki Machan: You can walk around the forest area and spend time near the lake. 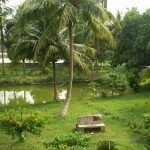 You can also visit the nearby ruins and laze on the resort’s lawns. How to reach Bhalki Machan: If you are traveling by car, then cross Bardhaman and drive about 30 km to locate the Mankor station. Follow the route and cross Mankor station to reach Abhirampur and finally reach Bhalki Machan. The total distance of Bhalki Machan from Kolkata is 135 km. Best time to visit Bhalki Machan: The site invites the tourist throughout the year. Lodging facilities at Bhalki Machan: Decent accommodation facility is offered by the well-furnished lodges built on the sides of the water body. Dining: You can relish the meals served in the lodge. Thank you for sharing this info on Bhalki Machan. I am glad having discovered your post. I’ll bookmark your weekend blog and come back from time to time. Pleased blogging.